Megan Hunt, the owner of Princess Lasertron, is a blogger, bridal designer and mommy to Alice Elfie (isn’t she precious?). We fell in love with her blog, which showcases her projects and offers a glimpse into her busy life. 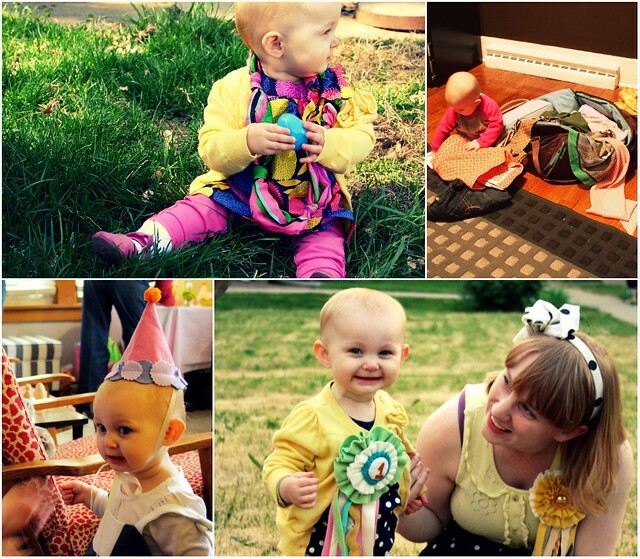 We were very lucky to have her guest blog about putting the finishing touch on a baby’s outfit with accessories and encouraging self-expression. Read on! When I became a mother to little Alice Elfie, one of the things I was most excited about as I held my baby in my arms was just getting to know her as a person and learning who she is, what she likes, who she wants to be. Over her one year of life I have followed Alice’s lead as she has experimented with scarves, hats, skirts, ribbons, and bracelets, and I can see in her smile and walk how confident she feels when she likes how she looks. Here are some of my favorite accessories for small children that are easy to wear and experiment with. Keep a few things for your baby to wear in his or her reach–you might be surprised by their creativity! 1: Dare to Dazzle bracelet from Modcloth – Bangles and cuff bracelets are easy for children to slip on and off themselves. Any chunky bracelets you have in your jewelry box are great additions to your kid’s collection. Alice has plain bangles and sparkly ones like this bow bracelet, and it’s interesting to see which ones she chooses each day. 2: Vintage Sangrita Hat from Modcloth – Vintage hats can be found cheaply at thrift stores and vintage shops and are often sized smaller than new hats. Simpler ones with fewer embellishments are best for little hands. 3: Bright Beads Necklace from Modcloth – Big necklaces are the easiest things for kids to put on. 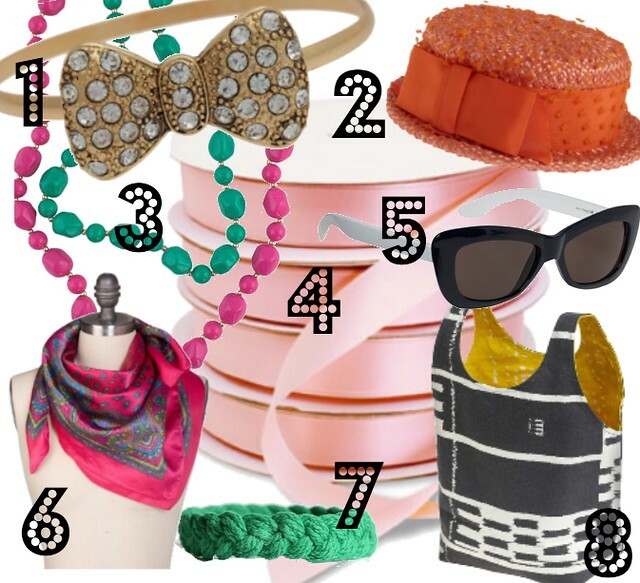 4: Pink satin ribbon from Paper Mart – Simple ribbons are so versatile and allow for so much creativity–is it a scarf? A belt? A headband? After Alice’s first birthday she was enthralled by the abundance of ribbon scattered all over our house from opening her presents–I think she liked the ribbon more than the gifts in some cases. As each ribbon was pulled from its box, she immediately draped it over her head before unwrapping the rest of the gift. 5: Classically Cool Sunglasses from Modcloth – Alice started wanting to wear sunglasses after seeing me wear them all the time. In the sunshine, she wears them on her eyes, and indoors she puts them around her neck. 6: Italian Paisley Scarf from Modcloth – Scarves are another very versatile accessory for babies and small children–you can knot it for them to wear as a necklace, or leave it open for them to wave, carry around, or wrap around their shoulders. 7: Sailor Knot Bracelet from Urban Outfitters – A woven or braided bracelet like this one is easy to make yourself from materials around the house–if you don’t have any yarn or rope, you can use strips cut from an old t-shirt or onesie. 8: Good for All Bag from Modcloth – the reusable bags you take to the grocery store, like this canvas tote, is a great place to keep all of your child’s accessories and dress-up things. Alice–in a “carrying” phase–totes hers around the house. You can teach your child to put their things away in it, or let them carry it as you run about town. Encourage your kids to play with your clothes and accessories. You might be surprised by what they do with them and it’s a great way to develop self-confidence and imagination in your baby. Read more about Princess Lasertron and see more gorgeous photos on her blog and shop her own line of heirloom-quality accessories.